Too many cooks spoil the broth? 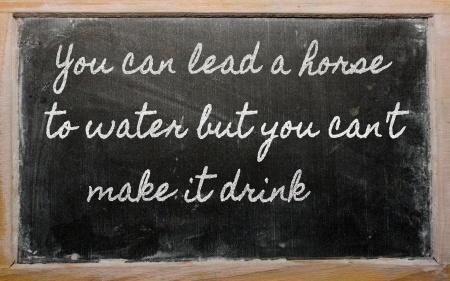 You can lead a horse to water but you can’t make it drink? Perhaps you greet these and similar phrases with the kind of incomprehension created by some job titles, where you can understand each word individually but haven’t a clue what they mean when strung together. These sayings are examples of old saws and proverbs, nuggets of folk wisdom which have been passed down through generations as guides to living. They are comfortable cliches which may be safely dropped into conversation with an air of wisdom and authority (to which the speaker sometimes has very little claim). However, the ideas behind these maybe-soon-to-be-forgotten sayings are still relevant. They offer suggestions for dealing with life’s challenges which are applicable to us all when we feel the pressure getting to us. This is a reference to mending garments, a practice which pre-dates the throwaway clothes culture. The idea is that a small rip in a garment is easy to mend but if you don’t mend it right away the damage will increase and the repair work will be greater. Recognising when you are beginning to get stressed will help you to take steps to manage the pressure so that it doesn’t build up. Get to know your pattern of response so that you are aware of reaching the tipping point between manageable pressure and significant stress. Look out for warning signs in the way you behave or in the way you feel, emotionally and physically or in your abilities to think clearly. Be aware of any changes in your usual responses. For example, you might be a bit prone to headaches but be ready to notice if they become more severe or frequent. You might be a bit of a softie and get weepy at any advert featuring cute animals or children but if you get strong urges to cry all the time or if you cry uncontrollably over next to nothing, it is a warning sign that something is wrong. You might have a little habit that you’re unaware of, such as tapping your foot, or looking distracted when asked a question, which reveals that you’re beginning to get wound up. You could ask someone close to you who you trust to let you know if you start doing this. The changes may be minor, but they act as a danger alert. Take action now and you won’t have to sew nine or more stitches (I know, you can’t even thread a needle). Isn’t this a lovely rural image. It makes you think of warm brown speckled eggs in a wicker basket, perhaps covered by a gingham cloth. The expression warns us to be careful when we gather the eggs which our hens have laid. We should put them in more than one receptacle so that if an accident should happen we won’t break all of them. If we invest too much in one particular area of our lives, or in one particular plan, we make ourselves vulnerable to stress if our security or well-being or self-esteem in that area is threatened. This is particularly so with those of us who over-invest in and over-identify with our work. Work takes up most of our time and it fulfils many needs but it is not actually part of ourselves, even if it sometimes it feels as if it is. Set some emotional boundaries. Let the personal qualities which make you good at your job enhance your whole life, not just one part of it. Here’s a weather-based saying, designed to cheer us in times of storms and gales. It tells us that some benefit may be found in adversity – it’s a more forceful version of every cloud having a silver lining. Finding benefits in an unwelcome situation can help to maintain balance and a sense of perspective. Being prepared to rescue or gain something from a setback keeps you upbeat and stops (oh, another saying) a molehill becoming a mountain. Of course you feel annoyed, or disappointed, or fed up when things go wrong. Accept and acknowledge your feelings, then allow yourself to look for a grain of positivity. If you mess up a project, learn something from your mistakes. If something you were looking forward to is cancelled, you have an opportunity to do something else. In bad weather, if you are a taxi driver or roofer, enjoy your extra revenue. At least the leak will make us get on with the redecorating. At least the delay means that we will miss the heavy traffic. No, you’re right, you can’t cure a disease by laughing it away. But laughter can combat depression and anxiety. A good laugh can have the same physical and psychological benefits as a brisk walk. It reduces the presence of stress hormones and at the same time releases endorphins into the blood stream. Seeing the funny side of things can help to keep our spirits up and to keep the blues at bay. What better reason for watching a film or a TV series or reading a book which makes you laugh out loud? And if anyone raises their eyebrows at your addiction to pets doing hilarious things on YouTube, don’t beat about the bush, just let the cat out of the bag and tell them it’s your stress-prevention shot in the arm.